Mac OS 9.0: Can not be installed and used. Mac OS 9.1: It can be installed and used. Mac OS 9.2: It can be installed and used. Mac Rhapsody: Can not be installed and used. Mac OS X Server 1.0: QEMU is not ready for this Mac OS X version. Mac OS X Developer Preview 1: Can not be installed and used. Mac OS X Developer Preview 2: Can not be installed and used (NVRAM Error). Mac OS X Developer Preview 3-4: Not looked. Mac OS X Public Beta: It can be installed and used. Mac OS X 10.0: It can be installed and used. Mac OS X 10.1: It can be installed and used. Mac OS X 10.2: It can be installed and used. Mac OS X 10.3: It can be installed and used. Mac OS X 10.4: It can be installed and used. Mac OS X 10.5: It can be installed and used (Use the mac99P Model). NOTE Rhapsody! :Mac OS have Rhapsody for x86. Every x86 Rhapsody versions can be run in VMWare and Virtualbox. 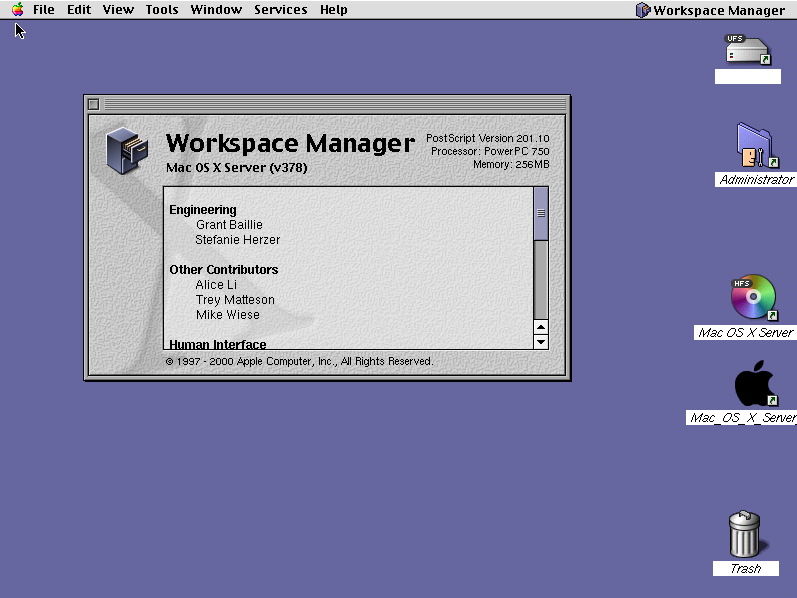 I have gotten Mac OS 9.0.4 installed in QEMU, but it must be machine specific (I think G4 Cube works). Also, Mac OS X DP2 can be installed if you enter OpenFirmware commands to spoof the machine model. 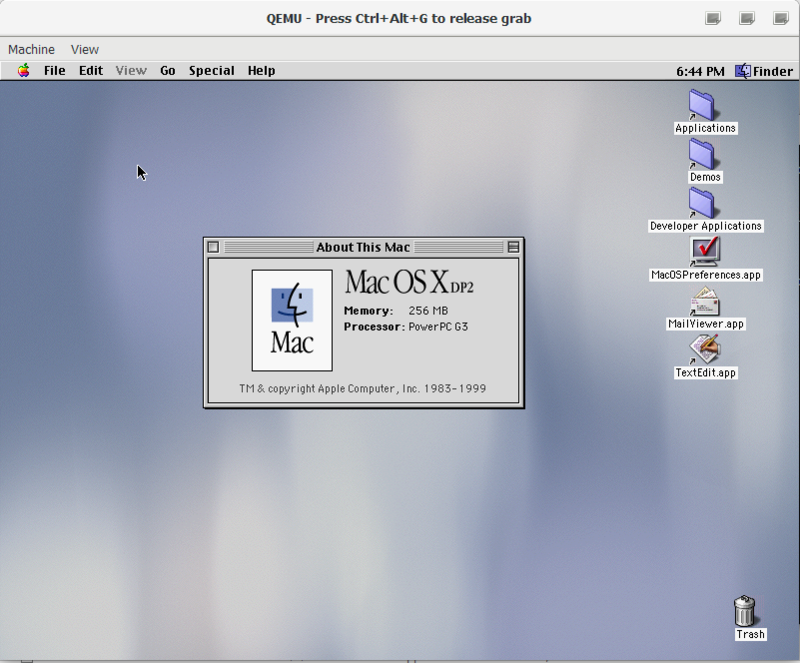 Mac OS 9.0.4 has been tested in QEMU and is not working. Mac OS X Developer Preview Not ready for QEMU (as drivers). It works but QEMU program for Windows does not run G3 Model. Is it true that Droem said it? Mac OS X DP cannot run on emulators as they are designed to run on very specific model Macs. Sorry but at least you tried. But it said that on the download page. Try running Mac OS Rhapsody on VMware or something. QEMU is a slow Emulator for Windows and can take 1 hour if you are installing Mac OS. For example, if You installing Mac OS 9.1, You see "17 Minutes Remaining". You need to make sure it can run on emulator with the hardware configuration it made for. Mac OS X Server 1.2v3 runs in Qemu, I have it running on Windows 10. It's very slow though and the mouse behaviour is erratic. OS X DP2 running in Qemu.